Austin Fashion has definitely come a long way. Besides the common sighting of techies in their t-shirt and flip flops, more and more Austinites are embracing fashion and their individual sense of style. This year, we held an official Austin Fashion Week Showcase Event at Underwear which is a darling little lingerie shop on West 12th Street. 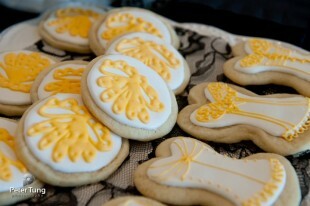 Sweet Pop provided the beautiful cookies inspired by the Abigail Earrings and Necklace, cake pops, and cupcakes. Peter Tung provided his wonderful photography skills in a delightful photobooth. Wanderlust Ice Cream provided refreshing ice cream and sorbet tastings. And, Inglenook Decor donated a generous gift certificate and jewelry holder to the raffle. And, lastly, a huge thank you to Austin K-EYE and Bettie Cross for featuring our event on their Austin Live news segment. We’re proud to call Austin our home and are looking forward to the continued growth of the Austin fashion industry.